Today's post comes from fellow fitness blogger Christiana of Spilling Coffee n' Dropping Things. Christiana recently wrote about a difficult experience trying dance fitness, so I knew I had to ask her to answer a few questions for us. As instructors (and, presumably, people who like to dance) it's hard to know what to say to someone who may want to try Zumba but is afraid or uncomfortable. Here's what she had to say. I e-met Jen from through the Girls Gone Sporty blogging network. She has a fun, energetic blog which totally makes me want to try her Zumba classes one day! 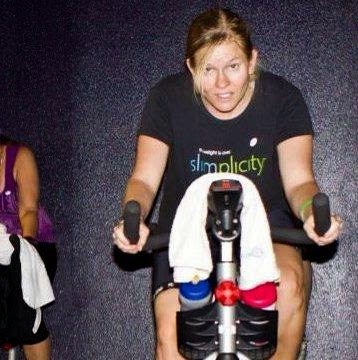 Christiana in a spin class! I have tried a couple of different fitness-dance classes in my day (different Zumba teachers, dance workout DVDs, and cardio barre, among others). Of course, trying doesn't mean a perfect run with accurate moves the very first time. As a kid in school I was a good, eager-to-please student and would study, but I got test anxiety: the minute I picked up the pencil I would forget everything I studied (as an adult in workout classes I know I can follow the teacher, which helps, but I still get a similar feeling!). I never took a lot of regular dance classes because I think my hypermobile joints along with ADHD just ended up frustrating me, my parents, or the teacher! Looking back, I think I needed a special ballet teacher or a specific trainer to show me poise, posture, focus, and body awareness, but sadly I never really learned. In college, I majored in children's theatre so I am familiar with choreography from musical theatre. But, I never felt like a coordinated athlete. I do love to swing dance the basics. I love salsa, too, but haven't had much practice. I've tried line & square dancing but I am not a big country fan. Jen told me she laughed when she read my Zico day event post (about taking a dance fitness class) because, from my description, she could imagine me flailing all over the place! But, flailing is different from failing! :) I am willing to try new things because a) I might just get a good ab workout from laughing at myself, and b) I might find a new song, meet a new friend, or learn a new cultural step or two! I realize with practice anyone can try anything! For me, it helps to watch dance videos where they pause to break down each move, which helps. In a gym class there are probably too many people and not enough time to break it all down. In order to really learn, I would need to study the videos every day then go try someone like Jen. I think Zumba is a fun, fantastic workout (and great for us who love multicultural or world music!) but do I love it enough to go every day? I like trying new things so I don't get bored on one machine, and so my muscles don't just peak and stay at one spot, so maybe Zumba is my answer! 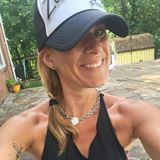 My advice to other people who are unsure of themselves but interested in trying dance fitness: To get the courage up, take a friend or check out blogs like Jen's or YouTube videos first. I encourage you to give it a go and try several styles (try a piYo class, a rock it workout, a piloxing class, a turbojam class, a different Zumba teacher) and see what you think! Give it a try! If at first you don't succeed, try, try again! The biggest fear for me, and it's rare you find guys doing this lol, is the fact that people don't want to feel like they're a fool if they can't dance right or pick up the routines immediately. The BEAUTIFUL thing about Zumba® is the fact that it is totally non-judgmental. No one is going to laugh or make fun of you while you're in a class. If anything, people want to help. Instructors certainly want to help. No one is looking for perfection here....the spirit of it all comes from the fact that you're in the class hearing great music, sweating it out with others that have similar fitness goals and for that one hour, putting the "world at large" on the side and just letting it all go.